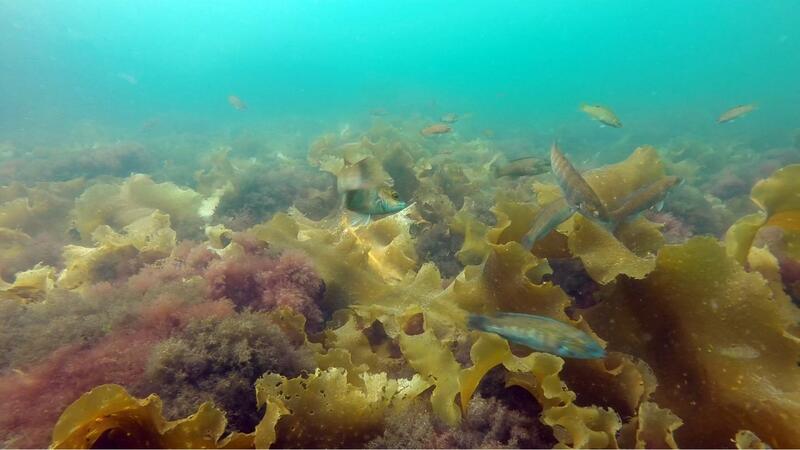 DURHAM, N.H. – When it comes to finding protection and a safe feeding ground, fish rely on towering blades of seaweed, like kelp, to create a three-dimensional hiding space. Kelp forests have been shown to be one of the most productive systems in the ocean with high biodiversity and ecological function. However, in recent decades, many kelp habitats have been taken over and replaced by lower turf-dominated seaweed species. Three species known to be predators of cunner – striped bass, pollock, and harbor seals – were seen on the video highlighting the real threat to cunner in the surveyed habitats. Researchers say while this study did not directly measure predation, they believe that cunner may become more vulnerable prey since they were easily seen by the researchers hiding in the lower, less dense seaweed. Researchers also note this could be even more detrimental to juvenile cunner who look for safe refuge more often. While further studies are needed, they caution that continued reduction in available kelp cover may signal the beginning of density-dependent mortality in cunner populations which may have cascading effects on other members of the Gulf of Maine ecosystem. Co-authors on this study, all from UNH, include Brandon O'Brien, '22, Ph.D. student; Kristen Mello '14, research technician; and Amber Litterer '16, Shoals Marine Laboratory. This project was supported by the Rutman Foundation through the Shoals Marine Laboratory, the School of Marine Sciences and Ocean Engineering and a faculty scholar award from the School of Marine Science and Ocean Engineering to JAD.